If you are wondering what to do with the longer, warmer days, why not consider using a pressure washer to clean up your outside areas? 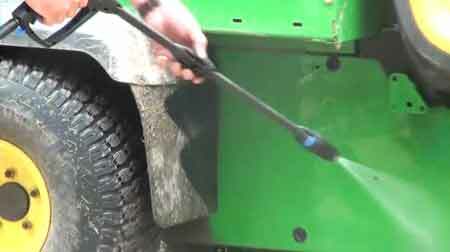 A pressure washer is a very quick way of cleaning up your garden. You can clean your whole outside area in a weekend and still have time to sit and enjoy the results. Patios and decks can get a bit slippery and dirty after the winter rain. Moss, algae and lichen will grow on these surfaces and can look unsightly in the wrong place. (Personally I like a bit of lichen on a stone planter, but I would rather not have algae growth on my decking). You can buy or hire pressure washers – so if you don’t have much storage space it might make sense to hire it. If you are thinking of buying one why not check out our expert reviews on the main website, we put all sorts of products through their paces and give you our opinion of the pros and cons of each model. Of course (as they say) other pressure washers are available! Hopefully though Mike’s thoughts will help you consider the points you need to think about before spending you hard-earned. You can also use pressure washers to clean paths, step, driveways and cars. In fact they are so addictive to use you will find yourself looking for things to ‘power wash’. Just don’t be tempted to use it on the dog! these things give off a really strong jet and a quick Google search will turn up any number of pictures of nasty abrasions caused by people power washing themselves or their friends. You are also advised not to use power washers on caravans or motor-homes in case the powerful jet allows water to get into the coachworks. A pressure washer (also called a power washer) is a great bit of kit for quickly blasting off soggy leaves, dirt and debris that build up over the dark days of winter. Leaving your garden looking Spring Cleaned and inviting for you to sit in it, admire your handiwork and have a well-earned rest. After all it is best not to overdo it! Move Over Velux, New Rooflight Company Coming Through!